continued  “I think being close to the Valley but not in the Valley is a big advantage,” she said. 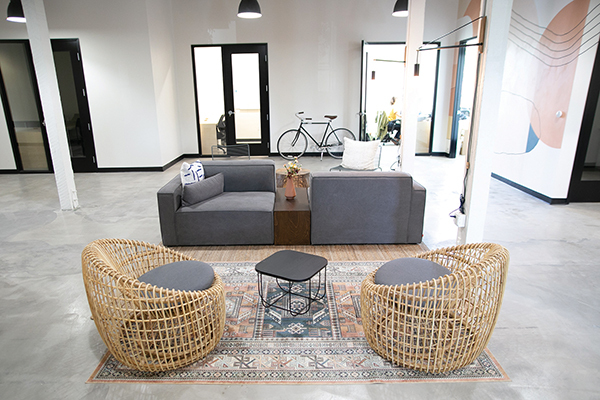 A coworking space at Liberty Station, Moniker Commons, recently expanded, adding 4,000 additional square feet of coworking space. Moniker Commons, a brand of Moniker Group, launched in 2017 in an 8,800 square foot space. Arlan Hamilton, the founder and managing partner of Los Angeles-based Backstage Capital, headlined San Diego Startup Week in June. Backstage, a venture fund formed in 2015 to back what Hamilton likes to call “underestimated” founders, has invested more than $4 million in 100 companies started by women, people of color and LGBT founders. The firm’s fund is closed, but since Hamilton’s talk, more than a dozen San Diego-based investors have pumped more than $100,000 into Backstage Studio, a venture studio within the Backstage organization formed to build and scale startups. Among the local backers of the effort: Tech Coast Angels’ Ashok Kamal, Caitlin Wege, Victoria Lakers and Daniel Grosu; Wharton Angels’ Amy Chang and Ellen Chang; Startup San Diego’s Neal Bloom and Al Bsharah; DeskHub CEO Jay Chernikoff; and BAM Communications CEO Beck Bamberger. “The diversity and eclectic mix of our syndicate reflects the mission of Backstage to fund diverse and underestimated founders,” said Kamal, who landed Hamilton as SDSW’s keynote.